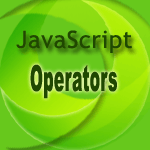 The new operator is used to create an instance of a user-defined object type or one of builtin object types which have a constructor function. objectName: Name of the new object. param1, param2, ....paramN : Property values for the object. To create a user-defined object type following steps are required. Use new operator to create an instance of the object. Example: Object type and object instance. Suppose we want to create an object type for students with three properties name, class, and rollno. To do this first declare the following function. To create an object called studentvi declare the following statement. The above statement creates an object called studentv and assigns it the specified values for its properties. Therefore the value of studentv.name is the string "David Rayy", studentv.class is the string "VI" and student.rollno is the integer 12. You can create any number of student objects by calls to new. Example: Object property that is itself another object. Now create an another object called school with school name, address, city, sdetails where sdetails prperty takes a student object as follows. The following web document shows how the new operator is used. See the Pen new-1 by w3resource (@w3resource) on CodePen.